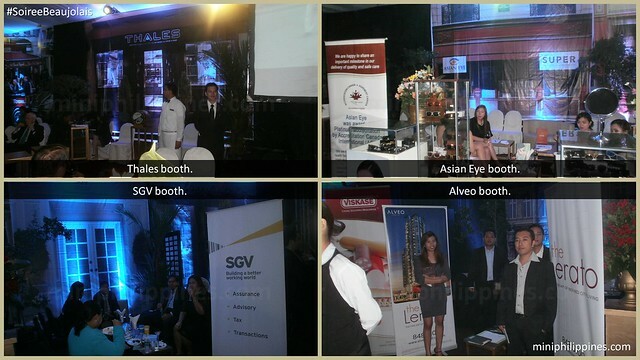 (Press Release 08 October 2015) – Resorts World Manila (RWM) President and CEO Kingson Sian, RWM Chief Operating Officer Stephen Reilly, other executives and employees, and various partners of the resort held a 6K Run for Charity and pledged cash donations, raising P1 million for the less fortunate children of Smokey Mountain, under the care and guidance of the Philippine Christian Foundation (PCF). RWM has been reaching out to the children of PCF, wherein volunteer employees provide valuable learning and fun entertainment for the kids by sharing their talents and skills in storytelling, arts, music and dancing, and handicraft making. PCF is a charitable institution founded in 2002 which aims to relieve poverty for children and their families who are living and working in depressed areas like dump sites and squatter camps in cemeteries. During the fund raising event, PCF Executive Director Melissa Alipalo took turns with the children sharing their stories with the participants. RWM is the first one-stop, non-stop entertainment and leisure destination in the Philippines that features recreational thrills, world-class performances, unique events, and exciting lifestyle options. It is home to three international lodging brands: Maxims Hotel, Marriott Hotel Manila, and Remington Hotel. RWM also hosts the Marriott Grand Ballroom, a three-story convention center housing the country’s largest hotel ballroom, and two more hotels – Sheraton Hotel Manila and Hilton Manila Hotel, both currently under construction. It also houses state-of-the-art movie theaters at Newport Cinemas, an award-winning Newport Performing Arts Theater, a cozy, 24/7 entertainment hub at Bar 360, and 50 restaurant outlets offering a diverse selection of local and world cuisine. 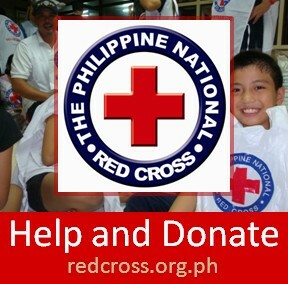 For more information, contact Archie Nicasio, Public Relations head of RWM via +63 (2) 836-0000 or go to www.rwmanila.com. La vie est trop courte pour boire du mauvais vin. 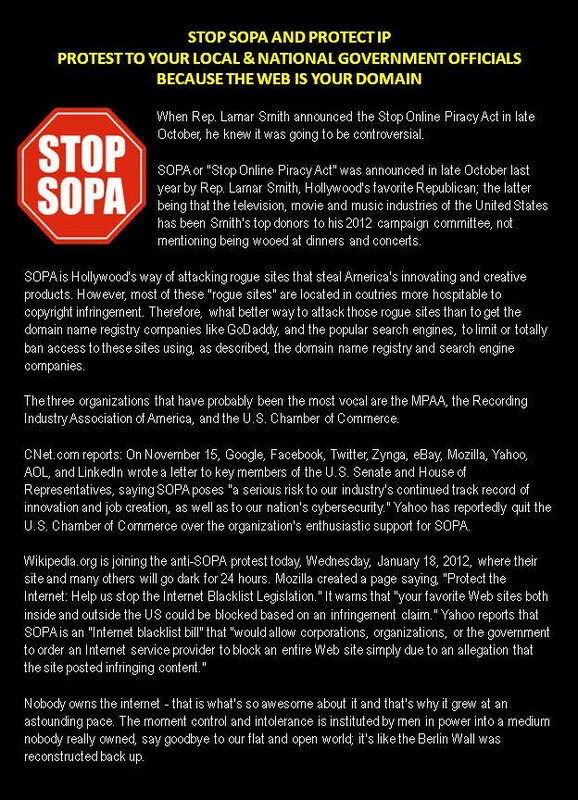 It is once again the third Thursday of November. No, that’s not Thanksgiving USA. This special Thursday of the month is the celebration of Beaujolais Nouveau – the new wine from the rich, fertile grape fields and wineries of Beaujolais region in France. It is the most popular vin de primeur or nouveau, fermented for just a few weeks before being released for sale on the third Thursday of November every year. Hence, this special day will also be celebrated by the French community in the Philippines together with guests from the diplomatic, corporate and social registers of the country. Oh, the French phrase above means “Life is too short to drink bad wine.” Sweet! 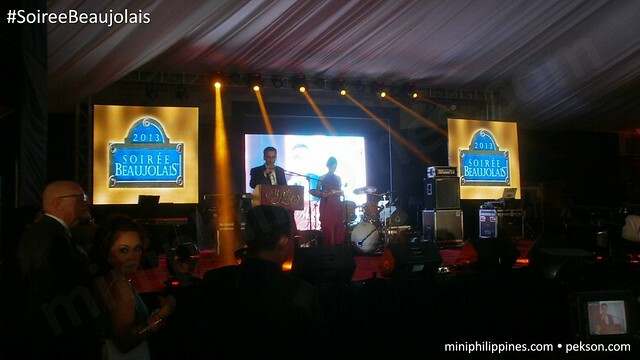 This year’s celebration of Beaujolais Nouveau will happen on Thursday (of course), November 20, 2014 at the Tent City of the Manila Hotel. 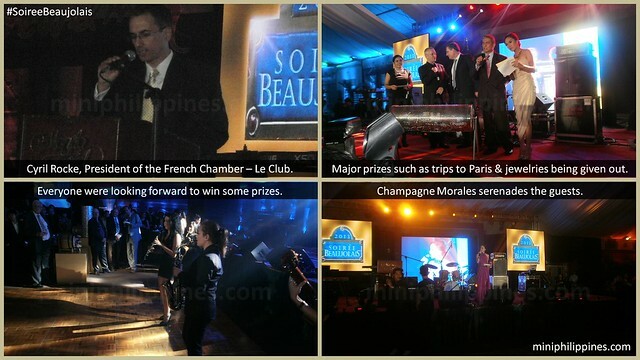 Organized by the French Chamber of Commerce in the Philippines—Le Club, the gala starts at six in the evening. 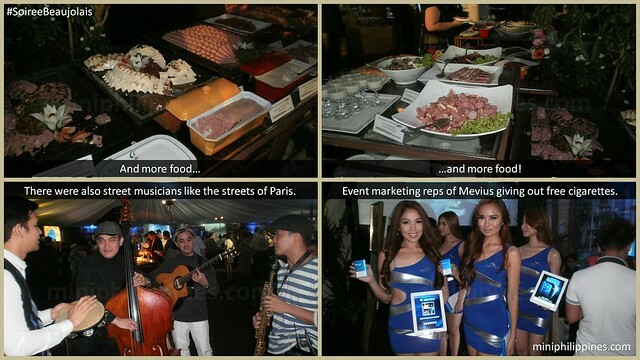 Last year’s event recreated the moments of Parisian street scenes with couture, music, food and, of course, wine. On Thursday, it will tell the story of France’s dynamic movement from the turn of the century in the 20’s up to today. Murals, visual collages, lighting, music, and the interpretative renderings in dance and other theatrical art forms are what’s in store for those attending this once-a-year celebration. The chamber has been celebrating the Soiree Beaujolais for the past 22 years in conjunction with a simultaneous gala in most countries of the world where there is a sizable French community including France, of course. 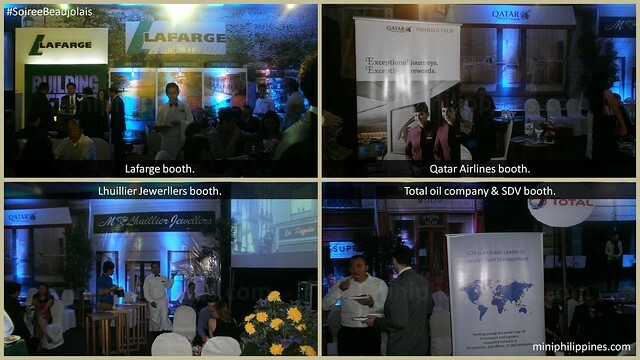 All the wine, cheese and delicatessen are being flown in from France while The Manila Hotel will prepare the other hors d’ oeuvres, charcuterie, oysters, salads, hot French cuisine, pastries and desserts. The Chamber President, Mr. Cyril Rocke, will welcome all the guests, while the keynote message will be delivered by His Excellency, Gilles Garachon, Ambassador of France to the Philippines. The Chamber Board of Directors, headed by Soiree Beaujolais Committee Chairperson and Past Chamber President, Mr. Bernard Flour, will lead in the uncorking of the new bottles, declaring the arrival of the Beaujolais Nouveau. 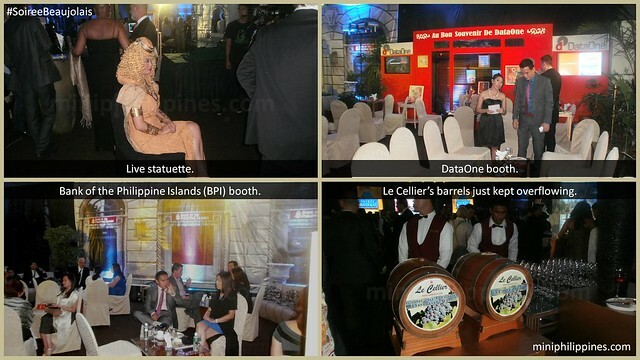 I wrote about the (then upcoming) Soiree Beaujolais, including its rich history from the French vineyards to the Philippine shores and how it has been celebrated for the past 22 years. That was the press conference the French Chamber of Commerce in the Philippines, also known before as Le Club, held in the Roma Salon of The Manila Hotel. 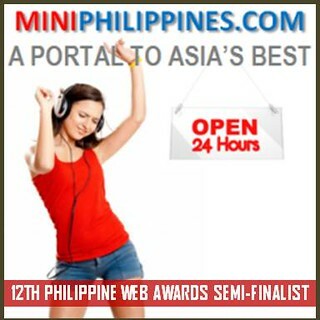 Last November 21, the online media publishing and marketing group PB Network which MiniPhilippines belongs to, was again invited to grace the event at the Tent City of The Manila Hotel. 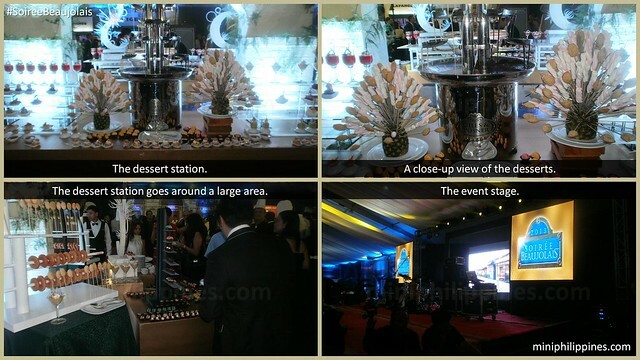 The sumptuous food was prepared by The Manila Hotel. Wine was served generously by Le Cellier. The cheeses and delicatessen – oh, the cheeses – were imported from France, as well as the Beaujolais Nouveau, the new wine from the rich, fertile grape fields and wineries of Beaujolais region. 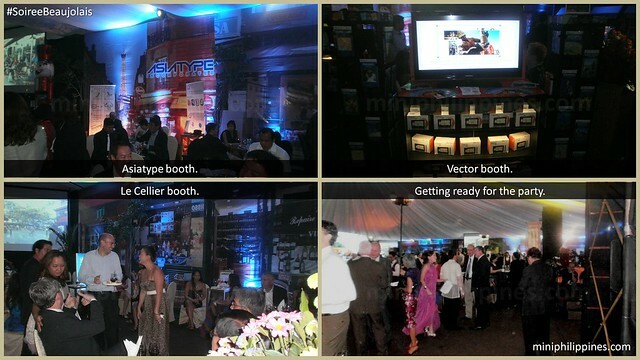 The PB Network group arrived at the Tent City of The Manila Hotel around seven in the evening. By past eight o’ clock, the number of people have swarmed to more than 2,000 in my guess-timate. 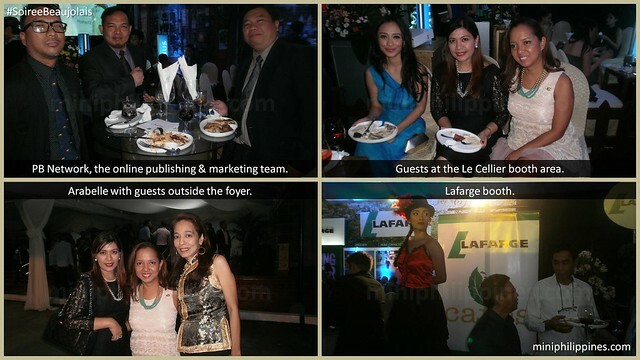 We were of course graciously ushered in and taken cared of by the media publicist of the French Chamber of Commerce-Le Club, Ms. Arabelle Jimenez of Ecrit Comm. I had a quick chat with Cyril Rocke, the president of the chamber and also president of DataOne (the hosting company in IBM Plaza), but being his most important event of the year, had too many things to attend to. 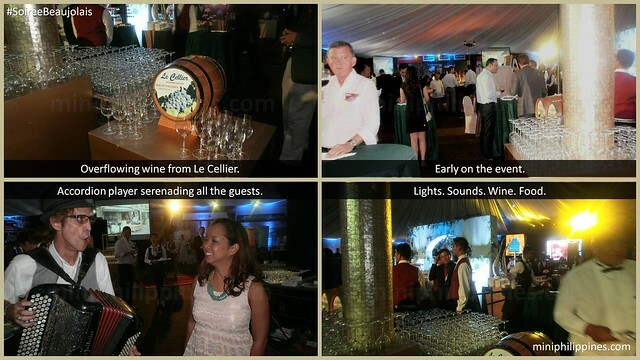 Also there to greet us was Bernard Flour, past president of the chamber and the owner of Le Cellier who provided the thousands of guests with overflowing wine. 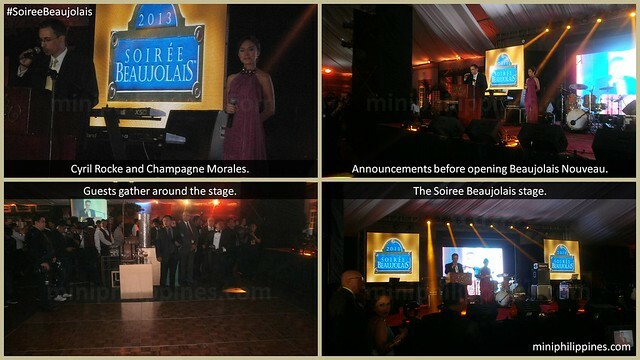 Champagne Morales, who hosted the press conference, was also the host of the Soiree Beaujolais event. Serving the Beaujolais Nouveau was done with some pomp on stage before everyone was invited to go to the serving stations and get their taste of the new wine. Because this Beaujolais Nouveau has not aged yet, the taste is quite unfamiliar compared to most of the aged wine bottles I buy. Still, it’s an experience worth the attendance. 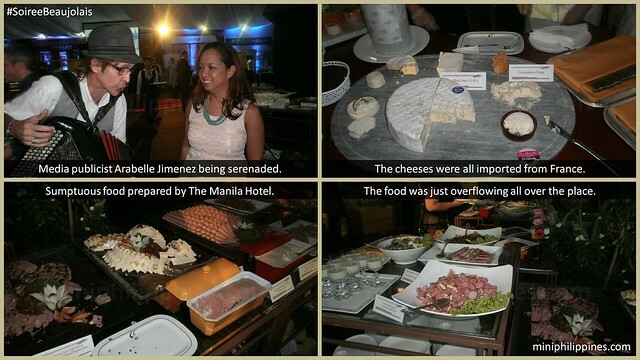 Music, dancing, wine, entrees, cheeses, delicatessen, desserts – that went on till the wee hours of the morning. I left before midnight, a little tipsy from all the combination of red wine, white wine and new wine; and of course, the cheeses! I think I should say that everyone who is reading this has to look forward to attending next year’s Soiree Beaujolais. It’s a once a year, if not at least once in your lifetime, that you enjoy what the people in the streets of Paris have been doing through the centuries. 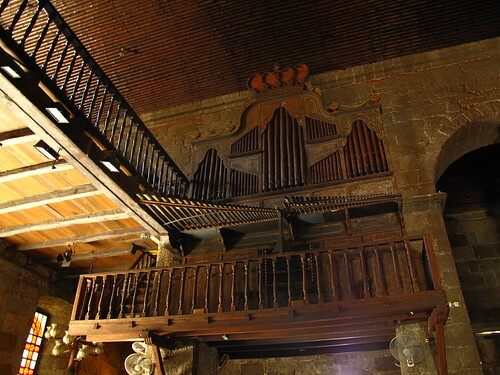 The 35th edition of the International Bamboo Organ Festival that will be held from February 18 to 24, 2009, will feature several musical masterpieces from various periods. JS Bach’s Cantata no. 130 and John Rutter’s Mass of the Children will the highlight of the opening Gala Concert. Swiss organist Guy Bovet, Filipino organist Alejandro Consolacion II, the Las Pinas Boys Choir, and the UP Singing Ambassadors will the featured performers of the evening. Other artists are soprano Karina Gay Balajadia-Liggayu, counter-tenor Mark Carpio, tenor Ervin Notes Lumauag, bass Noel Azcona and the Festival Orchestra under the baton of Eudenice Palarauan. The Festival has always designated one night exclusively for organ music. On February 19, organist Guy Bovet from Switzerland will be the featured artist for An Evening of Organ Music. One evening has likewise been customarily set aside for less serious musical fare. Entitled Concert under the Trees, the event is in fact one of the best-attended evenings of the Festival. On Feb. 20 the Singing Priests, the Morrizwind Orchestra and a surprise guest artist from the world of pop will be the stars of the show. Organ and Trumpet are an essential combination in Baroque music- organist Jarek Malanowicz from the Czech Republic and Filipino trumpet player Robert de Pano will play as a duet in the concert of February 21. On February 23, works by Filipino composers National Artist Lucio San Pedro and Alejandro Consolacion II will be performed in a concert dedicated to Filipino music and entitled Saring Lahi. Organists Armando Salarza and Rea Jimenez, the Las Pinas Boys Choir and soloist Bernard Caro, baritone Noel Azcona, tenor Ervin Notes Lumauag, and the Festival Orchestra will the performers for this event. Also part of the program are the Kasilag Trio (guitarists), named after the late National Artist Lucrecia Kasilag, while Eudenice Palaruan will the conductor for the evening. 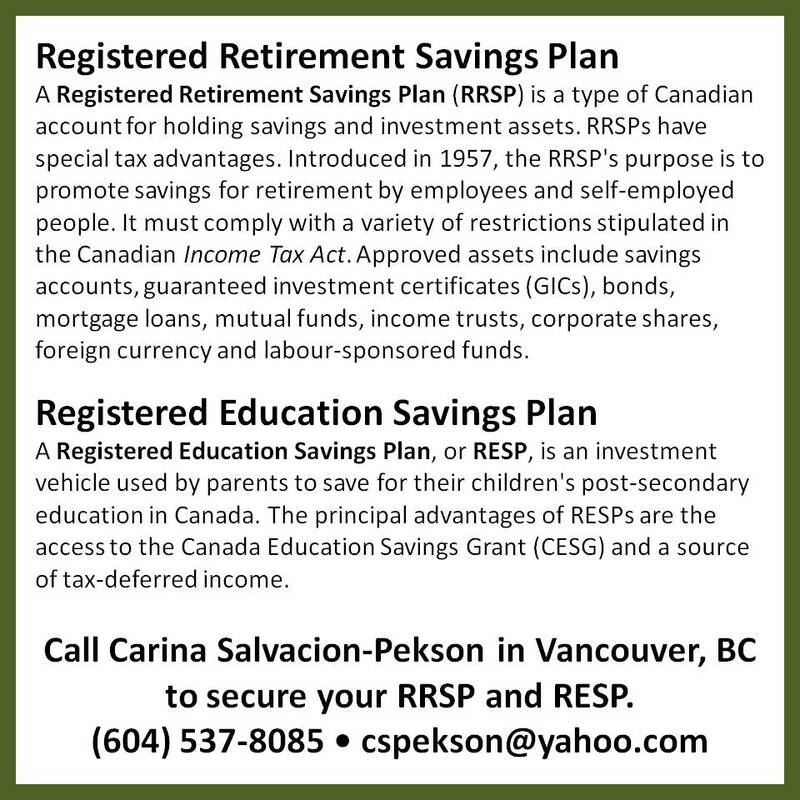 Source: Press Release from the Bamboo Organ Foundation Inc.